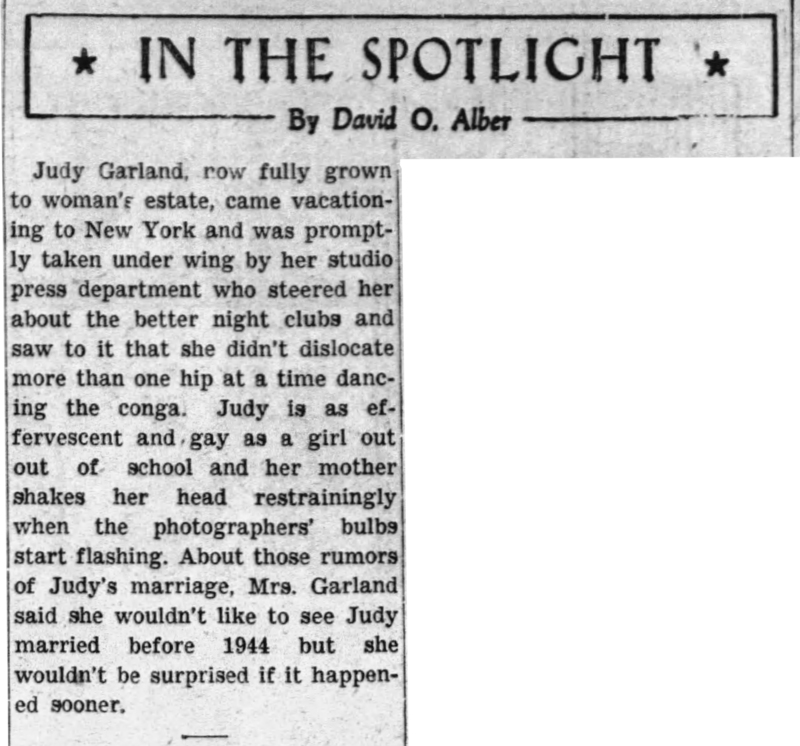 April 11, 1941: David O. Alber’s syndicated column makes it seem as though Judy had recently been in New York but there are no records of her traveling there in early 1941. 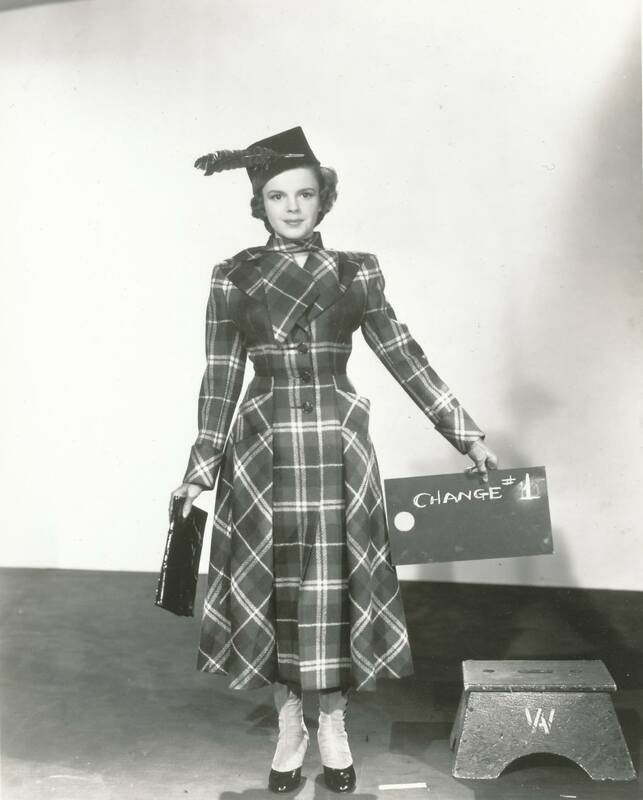 In early 1941, Judy was busy completing the filming of Ziegfeld Girl, appearing at the Academy Awards, appearing on radio, and beginning work on her next film, Life Begins For Andy Hardy. 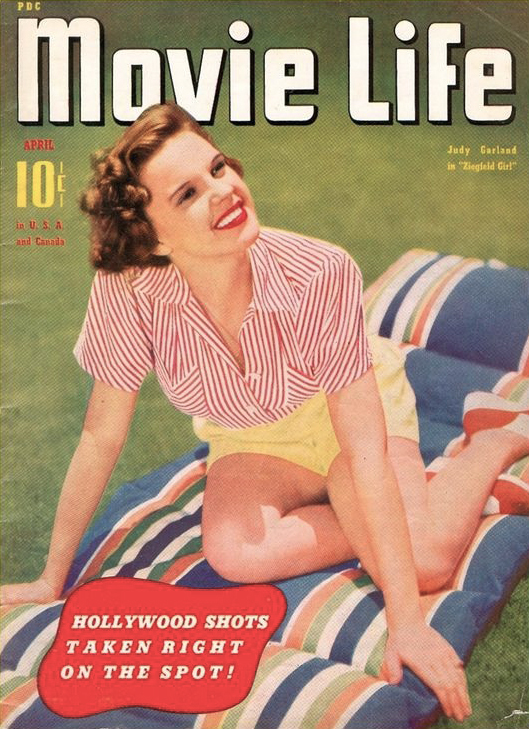 Also shown here is the April 1941 “Movie Life” magazine cover. Check out The Judy Room’s Extensive Spotlight on Ziegfeld Girl here. Check out The Judy Room’s Filmography Pages on the Andy Hardy Series here. April 11, 1942: A long day for Judy. From 10:55 a.m. to 6:05 p.m. she was filming scenes for For Me And My Gal on the “Interior Hotel Lobby” and “Interior Jo’s Room” sets. From there she went to the MGM portrait studio to pose for publicity photos. 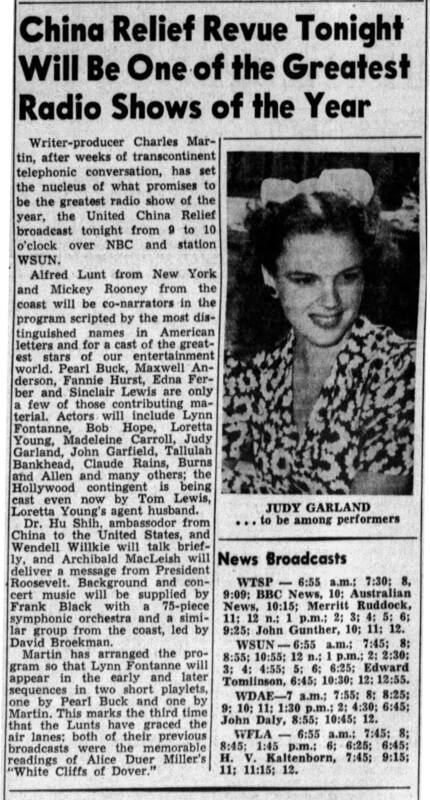 According to this article published in the Tampa Bay Times (Tampa, Florida), that evening Judy was scheduled to appear on the “United China Relief” radio show broadcast by NBC. There is no information about this broadcast aside from newspaper notices. No recording exists either so it’s unclear if Judy participated or not. 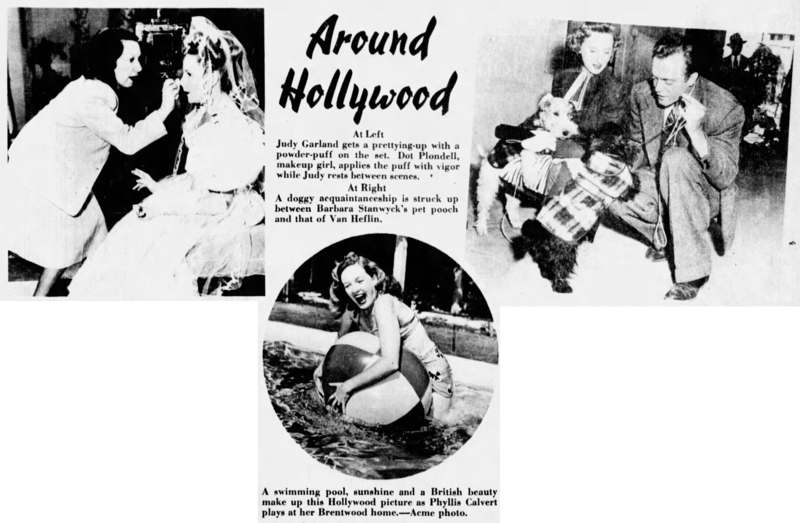 What’s interesting is that in spite of the stellar lineup of guest stars (including Bob Hope, Lynn Fontanne, Loretta Young, Claude Rains, Tallulah Bankhead, John Garfield, and Madeleine Carroll), the paper chose a lovely photo of Judy to accompany the article which indicates someone was either a Garland fan and/or knew that her image would attract readers. April 11, 1943: Judy and Mickey appeared on the cover of the Swedish fan magazine “Filmjournalen.” The two are seen in a promotional photo for Babes on Broadway. Scan provided by Kim Lundgreen. Thanks, Kim! Also on April 11, 1943: This article, written by Kate Holliday, appeared in quite a few papers around the country. It’s fiction from the creative minds at the MGM publicity department with just enough facts to make it believable. Note how each version of the article has a different headline. JUDY GARLAND, at 20, is neither child nor woman, a circumstance which often obtains with youngsters who grow up in the theater. She is neither entirely mature nor her own age, yet she is completely charming. At present, she is also a little pathetic. She would be the last to admit that. The seeming failure of her marriage has left her confused, but not sorry for herself. Judy has been closely concerned with the running of her own life since she was a child. So she did not return to her mother’s house when she separated from her husband. Instead, she took an apartment. It is her present pride and joy. It’s a small, sunny place, merely a living room, bedroom, dining room and kitchen. It is furnished in French provincial, with much brass and many growing plants. Only the bathroom presents a different note. What was formerly a little dismal is now a riot of red and white. The apartment is too tiny to house a maid, and Judy says she wouldn’t have one if she could. She does her own work. Sundays, particularly, find her madly vacuuming and sweeping. She is a fiend for washing ash trays. She likes dusting, but hates to make beds. And she’s a good cook. Show business is an old story to her; so old, in fact, that she needn’t make a production of being a star. She knows she is good. The studio knows it. So she is completely natural. Occasionally she makes a remark that sounds even younger than her 20 years. Childishly, too, she hates to fill out forms of any kind. Detail is her pet hate. Getting a ration book is worse than making a picture. She has a collection of records, ranging from Sibelius to Louis Armstrong, from Delius to Artie Shaw. Music is music to Judy. She says her father had a naturally beautiful voice, completely untrained. That’s where she got hers. She sings constantly in private life, thus keeping her voice flexible. She’s a little worried about the effect of this on her new neighbors. She hates to get up in the morning, though she presents a smiling exterior. (“You don’t know what’s going on inside!”). She has a temper which has been quiescent for years. When it erupts, she is actually ill. She can never feel the same toward the object of her wrath, no matter how pretty the subsequent apology. She usually is dressed in a suit with a frilly white blouse or a printed dress, over which she throws a fur coat. Her hats are small, feathered and wonderful. Through she was included to pudginess as a child, she is now thin. Her skin is translucent, accentuating her vital brown eyes. Her cheek bones are positive and her hair is red-gold. She has been more or less run down for a year and is planning to take a vacation for three months as soon as “Girl Crazy” is finished. Then she will rent a house in New England. She is ambidextrous: writes and eats with her left hand, plays all sports with her right. She wears her platinum wedding ring and the large square diamond Dave gave her. She likes long, bright red finger nails. She plays a shrewd game of poker. She is on the level, this kid. Her best friends are her sisters, a worker in the publicity department, and the thousand “little” people on the lot. And they are the ones who wish her the most happiness. She’s a little confused now, as I say, because she thought she had found everything with Dave and perhaps didn’t. But she’s handling herself and the situation with calmness, quietness and honesty. Also on April 11, 1943: This photo of Judy and Script Clerk Bill Doran on the set of Presenting Lily Mars made the rounds of the various newspapers. On this day Judy was in the midst of rehearsing the song “Embraceable You” for Girl Crazy. She recorded the song on April 15, 1943. April 11, 1945: Another day of filming the “My Intuition” number for The Harvey Girls. The song was filmed on location in Chatsworth, California which is in the northwestern San Fernando Valley region of Los Angeles, California. Time called: 10:00 a.m.; Judy arrived at 10:23 a.m.; dismissed: 4:55 p.m.
Photo: 1987 VHS cover artwork. April 11, 1947: Filming on The Pirate continued with scenes shot on the “Exterior Plaza” set. Time called: 3 p.m.; dismissed: 6:05 p.m.
April 11, 1949: Judy was ill and did not work. She had been filming scenes for Annie Get Your Gun since April 6th. Photo: The cover art for the early Promotional Campaign book created by the MGM Publicity Department, showing Judy as “Annie.” It’s unknown if this was ever sent out to the newspapers. Considering there are no images or artwork of Judy in the role of “Annie” printed in any papers at the time (per the newspaper archives) this was most likely an early draft. Be sure to read the new book about Dottie Ponedel, written by her niece Meredith Ponedel and titled “About Face,” now available here. Ponedel was quite a woman who had to fight for respect in a male-dominated industry. April 11, 1951: From the “Courier-Mail” newspaper out of Brisbane, Queensland, Australia. 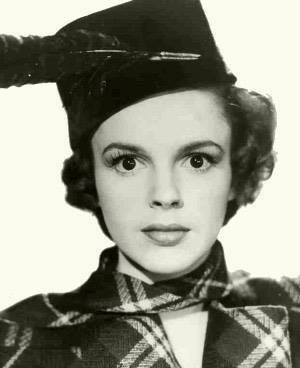 Actress Judy Garland last night got the biggest London welcome ever accorded a Hollywood Star. In a come-back after a year’s “nervous illness,” she was wildly applauded at the Palladium when she sang her old films songs and joked about her size. Judy was mobbed by hundreds of bobbysoxers outside the stage door. They kissed her, waved encouraging placards, and scrambled for her autograph. Judy wore a flared dress – lemon shot with black – that did little to hide her new, almost-matronly girth. 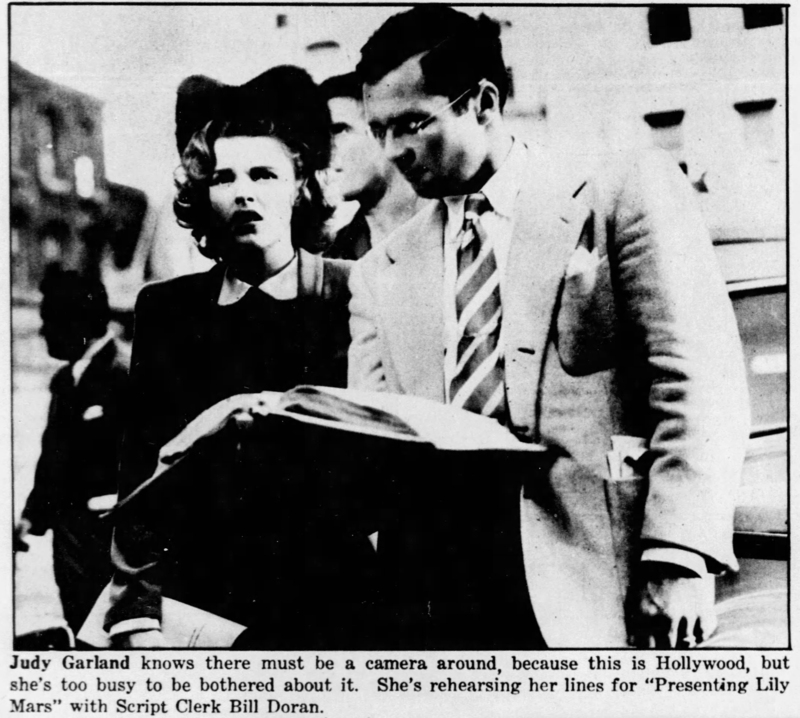 FLASHBACK: On June 20 last year, Judy was found in a Hollywood studio with a throat wound from a knife after she had been suspended by Metro-Goldwyn-Mayer for having missed a rehearsal. 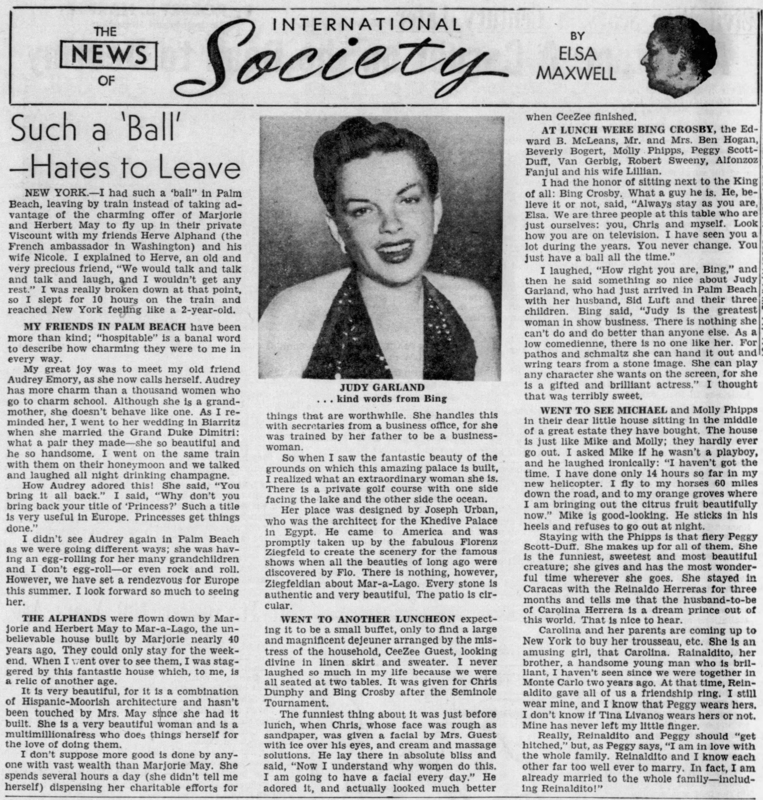 April 11, 1963: This review of I Could Go On Singing appeared in the San Francisco Chronicle. Three elements are combined in “I Could Go On Singing,” starring Judy Garland and Dirk Bogarde, which opened yesterday at the Esquire, Royal and Mission Drive-In. Miss Garland plays a singer who comes to London at the height of her career. Years before she had had a song, fathered by Bogarde, whom she rejected for the sake of her career. Since that time, Bogarde, a surgeon, adopted the boy, his wife died, and Miss Garland decides she wishes to see your lad. At first, the action is honest, for as a self-centered star, Miss Garland endeavors ruthlessly to buy his affection. But after tears and misunderstandings, Bogarde finally declares his love for her. This seems to be enough for her to continue with her career, while he and the boy, a winning British youngster, Gregory Phillips, apparently go back to their former way of living. The picture was made in England and there are several pretty views of the countryside, of Stoke Poges, and of London. The songs are sung long and energetically by Miss Garland, during which she is costumed and photographed in an unkindly fashion. One red dress is particularly unfortunate as it reveals the ravages times has worked on her figure, and neither make-up nor the camera conceal the effect her troubled years have had on her face. As a result, in contrast with Bogarde, who is extremely contained as the boy’s father and the eager young Phillips, she is an alien and grasping force. After the hopeful start, the picture bogs down into sentimentality and the initial contrast is dissipated. Jack Klugman and Aline MacMahon lend their polished talents to making more believable Miss Garland’s life in the theater. The songs miss Garland sings are old and not well-known, except for the title number. Ronald Neame directed. April 11, 1967: Judy was granted her divorce from Mark Herron. An audiotape of TV newscasts with Judy talking to reporters in the courthouse still exists. 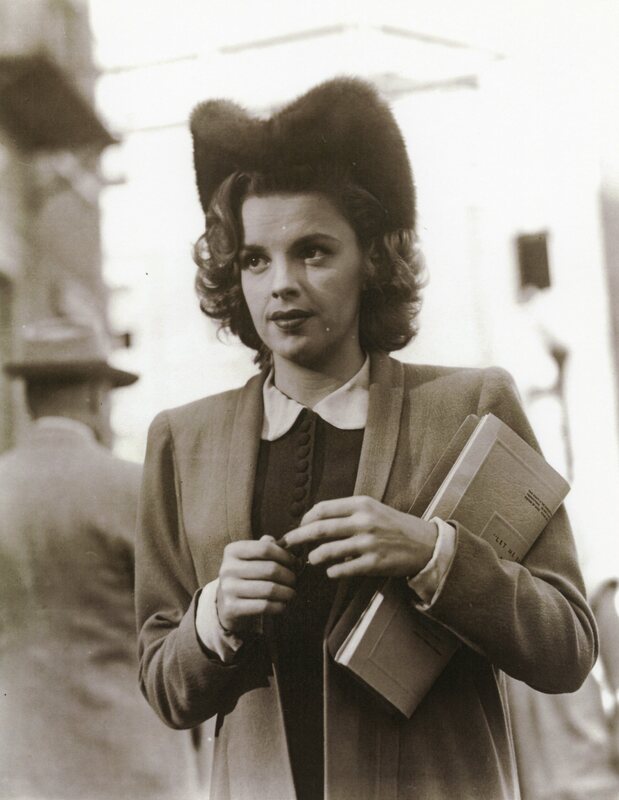 Judy also made “Judy Garland” her legal name; until this point, she had been Frances Ethel Gumm Rose Minnelli Luft Herron. Photo: Judy and Herron in 1964. April 11, 1968: Judy appeared in night court to press the charges against Tom Green that she had accused him of a few days before when she had him arrested. Judy charged Green with allegedly stealing two rings valued at $110,000. The charged would later be dropped against Green and they resumed their friendship. Photo above: Photo taken of Judy at night court on April 11th.